Biosensors Market size was valued over USD 17 billion in 2017 and is expected to witness growth of around 8% CAGR from 2018 to 2024. Increasing prevalence of diabetes has influenced industry growth positively. As per WHO, number of diabetic patients globally in 2014 were around 422 million that have escalated demand for glucose biosensors. Growing awareness regarding diabetes self-management has enabled integration of advanced technology in the glucometers driving the market growth. For instance, newly developed glucometers have embedded microchips that allows accurate and quick detection of sugar levels at home. Rising preference for such technology variant diabetic biosensors have boosted the industry growth significantly. Extended use of biosensors in various industries such as medical diagnostics, agricultural and food diagnostic industry has stimulated the demand for biosensors. Wide ranging applications of biosensors in diagnosis of various diseases such as diabetes, cholesterol, haemophilia will impact the industry demand positively. American population suffers from around 7000 rare diseases driving the demand for biosensors. Growing awareness for maintaining healthy lifestyle has stimulated demand for wearable biosensors that monitor various health parameters such as blood pressure, pulse rate, heartbeats and others. Increasing adoption rate of wearable biosensors amongst the population in developed countries will propel the industry growth. However, high cost associated with development of biosensor may hinder the industry growth. Wearable biosensor business segment dominated industry with the market share of around 56% in 2017. High market share can be attributed to growing awareness for healthy lifestyle. The developed as well as developed countries show high adoption rates for wearable biosensors due to sedentary lifestyle that has given rise to health issues such as obesity and other hormonal disorders. Moreover, increasing geriatric population that is more prone to chronic diseases has high preference for these wearable biosensors due to advantages offered by them such as ease of use and convenience, spurring the business growth. Non-wearable biosensor business segment is forecast to witness robust growth of 5.6% over the projection period, owing to increasing prevalence of chronic diseases such as diabetes, cancer and others that increase the preference for conventional methods of diagnosis and detection. These conventional methods include biosensors that are used in hospitals and laboratories for detection of blood sugar levels or analyzing the gas levels in blood. Increased accuracy and efficiency provided by non-wearable biosensors have impacted the segment growth positively. Electrochemical technology segment generated revenue of more than USD 11 billion in 2017. The segment dominates biosensors industry due to high efficiency and accuracy provided by the electrochemical biosensors. Increased use of electrochemical biosensors in food analysis and diagnosis of diseases has driven the segment growth significantly during the forecast period. Moreover, rising number of chronic diseases have elevated the demand for electrochemical biosensors to aid accurate diagnosis. Optical biosensors segment is anticipated to grow at CAGR of 8.9% throughout the forecast period due to increasing demand for optical biosensor. Optical fibre biosensors are used in optical biosensing devices in critical care and surgical monitoring. Benefits offered by optical biosensor are specificity, real-time measurement, remote sensing, fast, compact design that helps in minimally invasive detection; which in turn, drive the market growth. Blood glucose testing business segment dominated the industry in 2017 with a share of 73.4% and will continue to dominate over the forecast period. Increasing prevalence of diabetes has increased the demand for glucometer biosensors that will boost segment growth during the forecast period. Moreover, integration of advanced technology within glucose measuring biosensors has influenced the diagnostic decisions during critical surgeries impelling the segment growth. Cholesterol testing application segment is forecast to grow at a robust CAGR of 8.3% from 2018 to 2024. The robust growth can be accounted to the increasing cases of disorders related to obesity that escalate cholesterol levels in the blood. Increasing sedentary lifestyle coupled with growing incidences of hormonal disorders will increase the demand for cholesterol testing. Nearly 29 million Americans have cholesterol issues resulting in elevated business growth. Point of care testing business segment is forecast to grow at robust CAGR of 8.3% over the projection period. The growth can be attributed to the improvisations that are integrated in the biosensor devices, used in hospitals. Accuracy and efficiency of these biosensor devices have enabled enhanced surgical performance. Furthermore, rapid detection of analytes near to the patient facilitating better diseases diagnosis, monitoring and management have elevated the business growth. Home healthcare segment accounted a considerable market share of around 24% in 2017. Healthcare organizations demand accurate, reliable, and real-time diagnostic results provided by the diagnostic products that can be monitored remotely, irrespective of the patient’s location whether in a clinic, hospital, or at home which is provided by biosensors. U.S. dominated biosensors market in North American region with a share of 80.9% in 2017 and will continue to grow in the upcoming years. 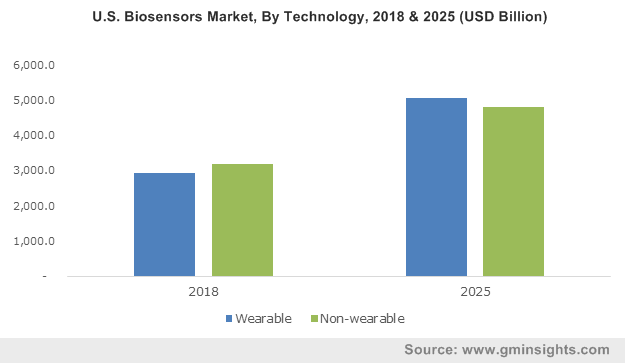 Increasing demand for wearable biosensors due to rising prevalence of chronic disorders such as cancer, diabetes, cystic fibrosis and other obesity related disorders in adult as well as geriatric population have surged the industry growth. Germany accounted for more than 24.8% share of European market in 2017 owing to high rates of adoption of advanced technology. Innovations incorporated in new biosensors devices enabling accurate diagnostic decisions and improving surgical performance will drive industry growth. For instance, development of electrochemical biosensors that detect the levels of anti-oxidants have proven to be beneficial in sustaining health of the individuals. Introduction of such new biosensors will propel the industry growth. 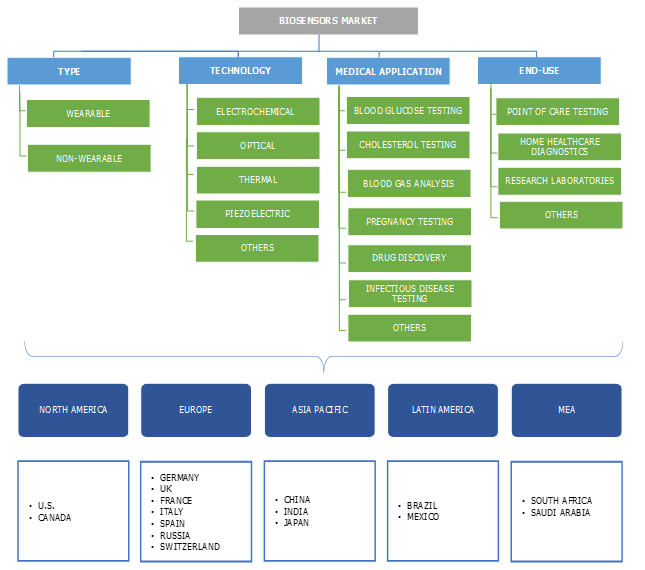 Some of the notable players operating in biosensors market are Abbott Laboratories, Bio-Rad International, Biosensors International, DuPont Biosensors Materials, Ercon Inc, Gwent Group, Innovative Biosensors, Inc, Johnson & Johnson, Molecular Devices Corp, Pinnacle Technology, QTL Biosystems, Roche Diagnostics, SDIX, LLC, Siemens Healthcare, TE Connectivity Corporation, Thermo-Fisher Scientific. These major industry players have sustained their market position by launching new biosensor devices that are integrated with advanced technology. In November 2017, Innovative Biosensors, Inc obtained exclusive licence for CANARY biosensor technology. Developing such advanced technology for biosensor devices will improvise company’s product offerings, thereby enhancing company’s market position. Key industry players have been focused on undertaking strategic initiatives that help them evolve as strong players in the market with a considerable revenue share. Biosensors market is oligopolistic in nature with few dominant players engaged in manufacturing superior quality biosensor devices. Moreover, rising prevalence of chronic disorders such as diabetes and hypothyroidism have impacted the industry growth positively. In addition to this, biosensors have variety of healthcare as well as other industry applications such as food diagnostics, agricultural and environmental enhancing the biosensors industry growth significantly.